Sandals are the one of the popular form of women footwear. You can find countless varieties of colors and designs in ladies sandals. A right type of sandal makes you feel more trendy, feminine and beautiful, but choosing the right pair of sandals is not an easy task. Following are few tips on how to match and wear you favorite sandals. These tips might help you get the perfect sandals. Sometimes you are really excited about the valentine day and on other hand you might also be worried about your looks. It’s a special day, so it is obvious that you would like to look gorgeous. 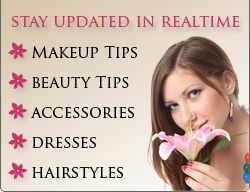 It is a perfect day to try a different style of makeup and achieve awesome looks. You can create a fresh, romantic look easily without any extra effort if you know the right method of applying the makeup for valentine day. A garment which is of cone or tube shaped and hangs down from the waist so that it covers all or some parts of the legs is known as a skirt. Depending on the current on-going fashion and ones own taste, the hemline of skirts can be as high as the upper thigh or as low as ground. There are many types of skirts available in the market and mini-skirt is one of the most in demand skirt that women like to wear these days. The skirt whose hemline falls several inches above the knee is a mini-skirt and different length mini-skirts are available now-a-days in the market. Blackhead is one of the most common skin problems. A Blackhead is basically a form of acne which drains slowly into skin pores and blackens, due to exposure to the sunlight or on oxidation. Blackheads commonly appear in the chin, forehead and sides of the nostrils on the face. The main cause of it is pollution, improper hygiene and excessive production of oil in skin, but it is possible to prevent them. If you want to look special on your prom night then you need to maintain a right balance between your dress, hair, make-up and your accessories. A perfect hair style can add bit of extra charm in your over all look. Therefore one should choose the prom hair style carefully. Women do give importance to their outer look and so they try out every cosmetic product which will make them appear beautiful. Before Organic Makeup came into the market, all the makeup products contained chemicals. These chemicals had bad effect on the skin and would lead to rashes and skin problem. After organic makeup was being sold out, most of the women went for organic makeup kits as the ingredients of organic makeup are organic in nature. Women blouses are highly comfortable for wearing in office or in home. They are generally worn with trousers, skirts, pants, capris and jeans. You can find them in several sizes, styles and colors and it also comes in both short and long sleeves. Some blouses also have embroidery, beads work, sequin work, mirror work, zari etc. In order to look best on your wedding day, you need to choose everything carefully. A bridal purse is an important bridal accessory because it not only affects the bride’s over all look but also provides a place for holding their essentials like lipstick, tissues, safety pins etc. A bridal bag has some special features that an ordinary handbag doesn’t have in it. It’s more elegant and decorated with crystals, beads, sequins and hand embroidery. It is also available in both traditional and modern style. In special occasions such as the holidays, proms, weddings and even a special dinner parties you would have a desire to look more glamorous and stunning. Choosing the right hairstyle to wear with a certain dress can make you look more glamorous and enhance your appearance. Therefore it is important to know how to match your hairstyles with your clothing for balancing the overall look. The style of your dress neckline is a very important thing to consider when you are trying to choose a right hairstyle to go with your dress.